Mr. Cooke is Vice President of the Network Business Unit at FUJIFILM Medical Systems USA, Inc., Stamford, CT. The Internet has revolutionized the delivery of many products and services. As a service, radiology has taken part in the Internet revolution. For example, radiologists once primarily worked on-site in hospitals. Today, ambulatory care is increasingly common, often separating the radiologist from the patient. As a result, remote image interpretation is now routine, and it is common to distribute soft-copy images across the healthcare enterprise. These trends create the need to image-enable thousands—if not tens of thousands—of desktops throughout an integrated healthcare network—many of which are outside of the walls of a hospital. Consumerism is another critical trend that is being fueled by the Internet. Today patients have easy access to a wide range of medical information and are able to educate themselves about radiology processes. As a result, they demand a high level of service, including rapid turnaround of imaging reports. Finally, the Internet may also be playing a role in the shortage of radiologists, as some elect to work in the computer technology industry. An estimated 380 million radiology procedures will be performed in 2008, representing an annual growth rate of 14%. The number of radiologists is growing at an annual rate of just 1.2%. Under these challenging circumstances, it is essential that we maximize radiologist efficiency, so that the quality of care can remain high. In 1999, a picture archiving and communication system (PACS) was easy to define. It consisted of a diagnostic workstation, a list of unread studies, and digital departmental storage. It was simply a system that enabled soft-copy interpretation of images. In essence, the computer replaced the light box. Today, defining a PACS is anything but simple. In addition to remote reading, we are faced with new imaging modalities that generate very large data sets with an increasing amount of dynamic and functional content. As multiple healthcare institutions come together to form integrated delivery networks, they create multisite workflow for the radiologist and others involved in patient care. There is an increasing amount of information available to drive workflow and guide decision making, but it must be navigated in an efficient fashion. In addition, with the push toward the electronic medical record, users are looking for portable, mineable forms of data storage. They also want enterprise access to images and information, not just in radiology but also in such clinical areas as cardiovascular medicine, pathology, mammography, and others. All of these trends create questions about what a PACS should look like. As we consider this question, we should be thinking about workflow, visualization, and infrastructure. As an industry, we must think of a PACS not as a monolithic system, but rather as a platform and an infrastructure for storage of data from multiple clinical areas, as a separate platform for visualization, and as a tool for overcoming workflow challenges. Radiology studies often traverse many boundaries. A large hospital may be served by a single radiology group, which, in turn, may be covering multiple different large-scale facilities as well as a small hospital that is struggling to retain radiology services. The radiology group may also be outsourcing some of its work to a nationwide reading service or so-called super group. A typical radiologist reads on ≥6 different PACS systems. This translates into at least the same number of platforms for 3-dimensional (3D) visualization, the radiology information system (RIS), and the reporting system. The need for radiologists to switch between various user interfaces creates both a great challenge and a great opportunity for integration. 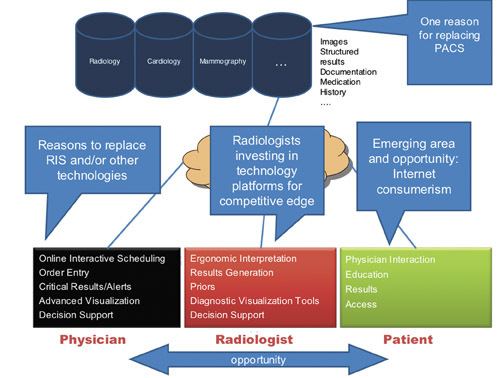 For example, the mandate to maximize radiologist efficiency creates the opportunity for a new kind of integrated worklist that takes into account all of the healthcare sites the radiologist serves and brings together a variety of tasks ranging from report signing to peer review to protocoling of examinations. 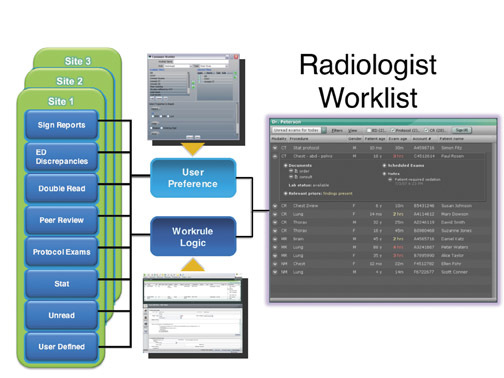 By drawing from combined user preferences and workrule logic, this information can be presented in a dashboard format for navigation by the radiologist (Figure 1). Combining diverse systems into a common worklist/dashboard allows a radiologist an integrated view of the work he or she has to perform. Once the radiologist gets to that work, it is very important to have the right kinds of tools available, including advanced visualization. These tools need to be integrated not only into the PACS for use in normal day-to-day operations, but also into other applications, given that new kinds of viewing models will be incubated outside of the PACS in many cases. These tools also need to be distributed, because diagnosis is now distributed. Radiologists should not be constrained by the limitations of the environment in which they serve. All necessary information and tools need to be accessible in a way that facilitates efficient and ergonomic interpretation. In addition, our systems must be able to provide, at a minimum, a collaborative connection between the radiologist and the clinician. It is interesting to visualize how all of these demands might play out in the future and what impact the Internet will have (Figure 2). Hospitals may seek a common infrastructure for radiology, cardiology, mammography, and other specialties—one that integrates images, structured reports, documentation, and medication history into a decision support system. The desire to integrate various imaging modalities into a common infrastructure may be a reason healthcare institutions are looking to replace their PACS. They may also be looking to replace their radiology information system and other technologies as a way not only of improving workflow but also of maintaining their physician base. Referring physicians may demand online interactive scheduling, order entry, critical results alerts, advanced visualization, and decision support-and hospitals may seek to provide these services as a way of retaining their relationship with physicians. Certainly radiologists are starting to invest in technology platforms that help them gain a competitive edge through more ergonomic and efficient interpretation, access to prior studies, results generation, diagnostic visualization tools, and decision support. Better communication with patients is also an important emerging opportunity. Interaction with physicians, education, and results reporting can all be facilitated by the Internet. A unique opportunity exists for our industry to connect all healthcare stakeholders through the use of Internet technology. We must act quickly, as technology is changing at Internet speed. As vendors, we must define our goals and deliver value. We must open our systems and enable integration opportunities without creating technology stagnation. We must continue to collaborate with stakeholders in the healthcare industry. We must continue to adapt and exploit consumer technologies. Perhaps most important, we must “humanize” radiology by involving the patient, involving the referring physician, and putting a human face on the radiology process. How the Internet is revolutionizing radiology. Appl Radiol.